Ben Nicholson (Denham, Buckinghamshire 18941982 London) came from a wealthy family of artists. His parents were the author William Nichsolon and the painter Mabel Pryde. He himself had six children from three marriages. His second wife was the artist Barbara Hepworth. Ben Nicholson is celebrated as one of the most influential and radical British artists of the twentieth century for his ability to synthesise and abstract nature and transform it into compositions of extreme elegance and clarity. His paintings and reliefs are for the most part geometrically composed, using formal and rigid lines. As one of the greatest draughtsmen of the twentieth century, Nicholson achieved this not only in his paintings, but also in his prints. Ben Nicholsons ability to transfer lines and shapes to carved and etched media is unsurpassed. His arrangements of lines reflect a particular sense of rhythm. Nicholson received numerous awards, including the opportunity to represent Great Britain at the Venice Biennale in 1954. In 1968, he was awarded the British Order of Merit by Queen Elizabeth II. 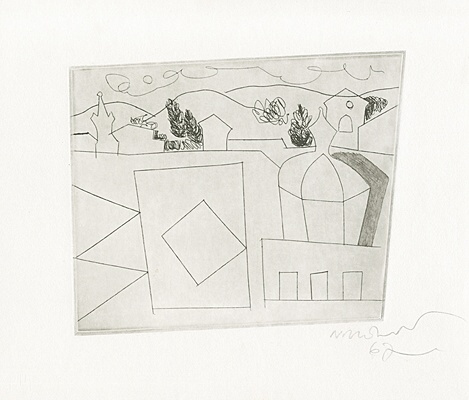 Ben Nicholson died in London in 1982 at the age of eighty-seven.